Thank You Deputies Zuno and Hensel, Today You Saved More Than A Life – Peninsula Moves! In a month like Caltrain and its customers have had, it is easy to be overwhelmed by two pedestrian deaths so close together. But it is important to remember that the Transit Police stop far more potential tragedies as they patrol the corridor every day. Early this morning, two Transit Police Officers saved a life. San Mateo County Sheriff’s Deputies Zuno and Hensel, part of the Transit Police unit, received an anonymous call about a man behaving in a suspicious manner on the tracks south of the Hillsdale Caltrain Station. Within minutes they were on scene, where they could see that someone was standing in the path of an oncoming southbound train. “We ran toward the subject, yelling for him to clear the tracks. He did not respond,” said Deputy Zuno. Recognizing that a potentially fatal situation was unfolding at that moment, the deputies sprinted for the man, pulling him from the tracks before the approaching train could reach him. The man indicated that he was distraught and confirmed that he had intended to allow the train to hit him. The unsung hero in this story is the anonymous caller who took the time to report the suspicious behavior. 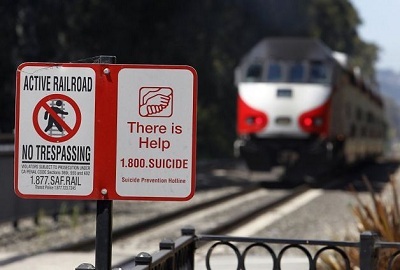 Caltrain kicked off the safety campaign, “See Something, Say Something” earlier this year. This positive outcome demonstrates the importance of taking a moment to make a phone call when something seems off. Say something, it works. Caltrain customers can report unsafe or suspicious behavior and other urgent concerns by contacting Transit Police dispatch directly at 877.SAF.RAIL (877.723.7245). For questions about Caltrain service, customers can call 800.660.4287 or visit Caltrain.com. Very proud of the courageous actions of Deputies Zune & Hansel. They are two of the many dedicated dedicated men and women in the Sheriff’s Department serve the people of San Mateo County every day in an exemplary manner. Awesome job by the two deputies. Very awesome job by the caller that made that very important call.